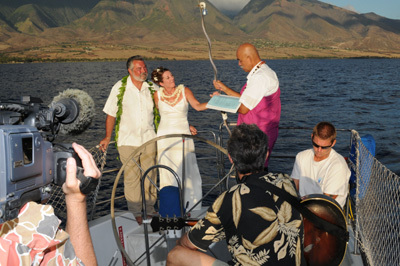 One of the most exciting wedding ceremonies we offer is our Sunset Sail Wedding in Maui. Couples usually come casually dressed for their ceremony while the captain and crew sail the calm waters off Maui's Lahaina coast aboard the Scotch Mist II. Everything for a fabulous wedding is included. Choose from your choice of over 17 ministers/officiants to perform your ceremony. Rev. Keli'i Tau'a is our most requested Hawaiian minister aboard our Sunset Sail Weddings. Your photographer and videographer capture all the action while you and your guests enjoy Champagne and appetizers for the first hour of your two hour sunset cruise. Also aboard is our singer guitarist Tim O'Hara who, besides playing during the ceremony, keeps the cruise lively throughout. Just yell out what music you would like to hear and he can accommodate you. Sunset Sail Weddings usually are an intimate affair with couples bringing just a few close family or guests. If you have more guests, consider our Celebrity Yacht option. This 57 foot yacht is often used by celebrities and heads of state. Britney Spears, Princes and Kings often choose this yacht for intimate and luxurious cruises around Maui. Which ever yacht you choose, you can be assured of first class service and attention to detail. Our team is waiting for you with plenty of Aloha during your Sunset Sail Wedding in Maui.